Summer begins inBarnaCity, the tourism capital of Extrema Europa. The headlines read: “Japanese tourists attack old people and children at theSagradaFamiliaWater Park”. Twitter is aflame, anti-Japanese phobia is running rampant and the local Asian community is hiding in the hotels. The public doesn’t yet know that the aggressors aren’t just a pair of crazy Japanese but something far more unsettling. The former Inspector and Zen Master TakeshiSakamurasets out to investigate on his eighty-fourth birthday. He needs an assistant to translate between Japanese and the western tongue and also to teach him about the ‘modern internet’. At theGaudíCannabis Club he will meet the Millennial generation and meet the rare beauty Lilith, a mercenary hacker and hunter of psychopaths who lives with her cat Telefunken. Will they manage to uncover the plot set by the wildest super villain in the city? The question seems rhetorical: the good guys don’t always deserve to win, not even inBarnaCity. A story that combines intelligent humour with crazy characters and a funny, biting criticism of our society. A new case for the unique and funniest character Sakamura, the former Special Brigade Investigator, who must solve the Japanese tourist-vandals running rampant in Barna City. 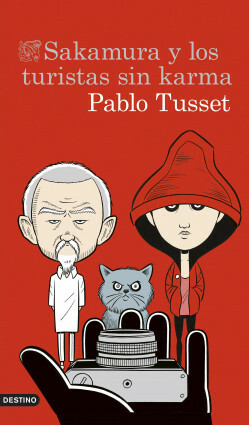 Tusset returns with a novel that will be loved by every reader who enjoyed Sakamura, Corrales y los muertos rientes (over 30,000 copies sold). FrankfurterVerlagsanstalt (Germany), Sammako (Finland), Opera (Greece).